The MOD has today announced a restructuring of management in the Defence Equipment and Support (DE&S) organisation. From 3 May 2011, four Chiefs of Materiel will be responsible for delivery of outputs and the Chief of Defence Materiel will head the commercial function within the Department. Since being appointed Chief of Defence Materiel in January, Bernard Gray has been examining the way forward for DE&S and seeking to understand the freedom of manoeuvre that the organisation needs, and how that is best achieved. Andrew has made a huge contribution to DE&S since 2006, particularly in his tenure as Chief Operating Officer, for which I am enormously grateful. The responsibility for managing the delivery of DE&S equipment and support teams will be split across the existing Single Service Chiefs of Materiel, and a new fourth post, a civilian Chief of Materiel (Joint Enablers). In addition, the post of Chief of Corporate Services has been replaced by Director General Resources, who will act as the Finance Director of DE&S, to improve the focus on financial management in DE&S. The division of line management responsibility between four Chiefs of Materiel will allow DE&S to give greater support to the teams delivering our projects. As already announced, the current Director General Defence Commercial post is being disestablished. 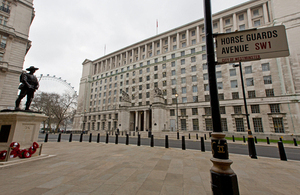 Departmental leadership for commercial advice will be transferred to the Chief of Defence Materiel, and the MOD commercial function will be reorganised. DE&S will now act as the lead TLB for commercial activities. Moving to this structure at this time offers a number of advantages. It will ensure that there continues to be senior level focus on our delivery to operations as we go through this period of change. It removes the distraction of uncertainty around senior organisation change at a time when we need to make important decisions on strategy. It provides greater balance of responsibilities across senior managers and a robust basis for them all to engage in the future purpose and operating model of DE&S.